Kale, or Brassica oleracea L. (Acephala group), is a leafy green vegetable similar to cabbages and broccoli. You can eat kale raw or cooked, and it is a source of many essential nutrients. The vegetable can be good for weight loss if you include it as part of a calorie-controlled diet that consists primarily of moderate portions of nutrient-dense foods. To lose weight, you need to consume fewer calories than you expend. Eating foods with low calorie density can help you lose weight because they help you feel full before you have eaten too many calories. Most vegetables are good for weight loss because they are low in calories, and 1 cup of raw kale contains only 33 calories. For a low-calorie lunch, make vegetable soup with low-sodium chicken broth, tomato paste, onions, carrots, celery, chicken breast and kale. Kale can help you lose weight if you eat it and dishes with kale instead of higher-calorie options. Instead of potato chips or another fried, crunchy snack, try kale chips baked with garlic and black pepper. For a low-calorie side dish, eat kale cooked with mushrooms, garlic, red wine vinegar, diced onion and sliced mushrooms instead of higher-calorie choices, such as buttered vegetables or mashed potatoes and gravy. Add kale to soups, stews and spaghetti sauce to make them more satisfying, but not much higher in calories, so that you eat smaller portions of higher-calorie foods. Each cup of raw kale contains 2.4 grams of dietary fiber, or 10 percent of the daily value based on a 2,000-calorie diet. Dietary fiber is a nutrient that helps reduce hunger and aids in weight control. Protein is another filling nutrient, according to Harvard University, and a cup of kale contains only 3 grams, or 6 percent of the daily value. Some high-fiber, high-protein dishes with kale are stewed chicken with kale, tomatoes and Italian seasoning, and a salad with cooked kale, kidney and garbanzo beans, cumin and garlic. Choosing nutrient-dense foods, such as kale, is particularly important when you are on a weight-loss diet and are restricting your food intake. 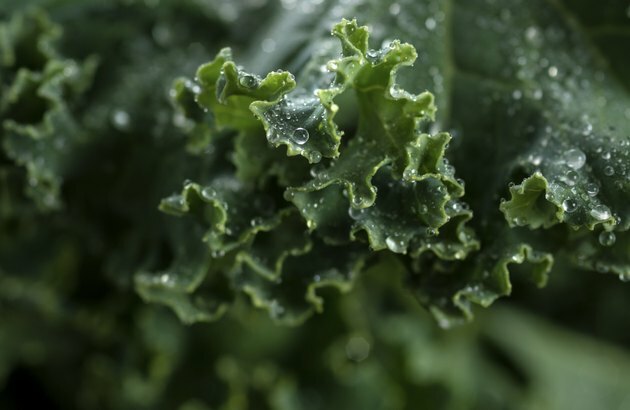 Each cup of raw kale provides 80 milligrams of vitamin C, or 133 percent of the daily value; 6,693 international units of vitamin A, or 133 percent of the daily value; and 472 micrograms of vitamin K, or 590 percent of the daily value. It is also a source of calcium, which supports strong bones; potassium, which can help lower blood pressure; and iron, which is a component of healthy red blood cells.